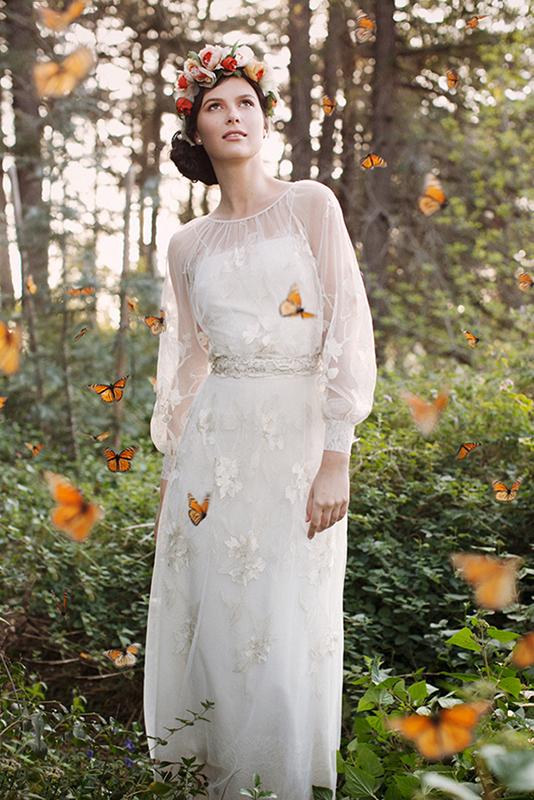 English Garden Inspiration | Green Wedding Shoes Wedding Blog | Wedding Trends for Stylish + Creative Brides. What can I say about this amazing shoot featuring my headpieces along with Clarie Pettibone’s romantic gowns shot by Stephanie Williams of This Modern Romance. It was based around the Film Bright Star about the romance of John Keats & Fanny Brawne. What a day it was, trying to get live Monarch butterflies to do what we wanted. They were the most gentle & friendly creatures. They arrived by post in coolers from Swallowtail Farms & I baby-sat them for 3 days until the shoot. In the following days after the shoot, I spotted the beauties flying around my neighborhood. Although I know they were happy, I was sad to see them gone after taking care of them & worrying they would not make it for the shoot while they rested in gentle slumber in the cooler. 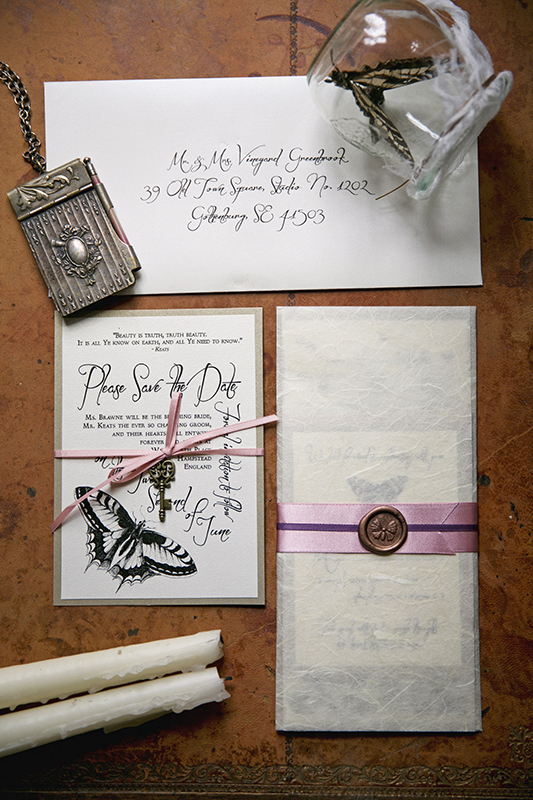 My only regret, was that the beautiful hand made stationary that Josephine from Vintage Invites handmade especially for this shoot, did not make it on the Green Wedding Shoes Posting. 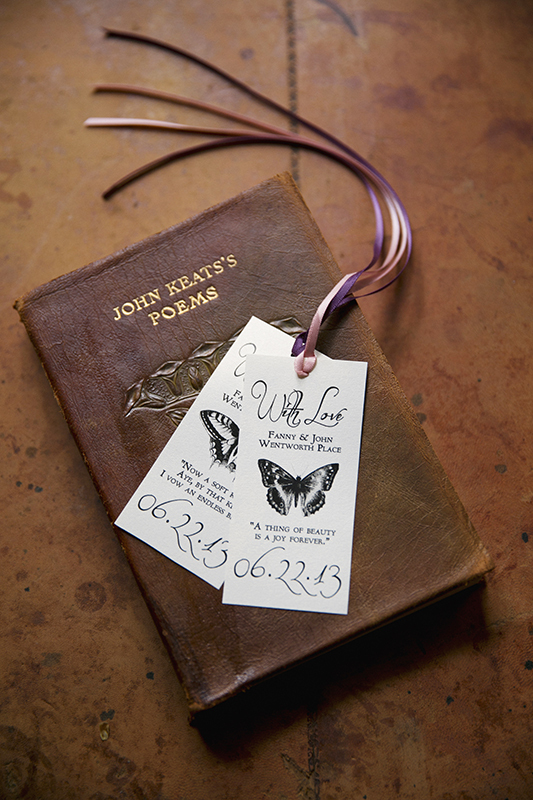 She even wrote the original & true addresses of John Keats & Fanny Brawne on the stationary along with the hand drawn butterflies. 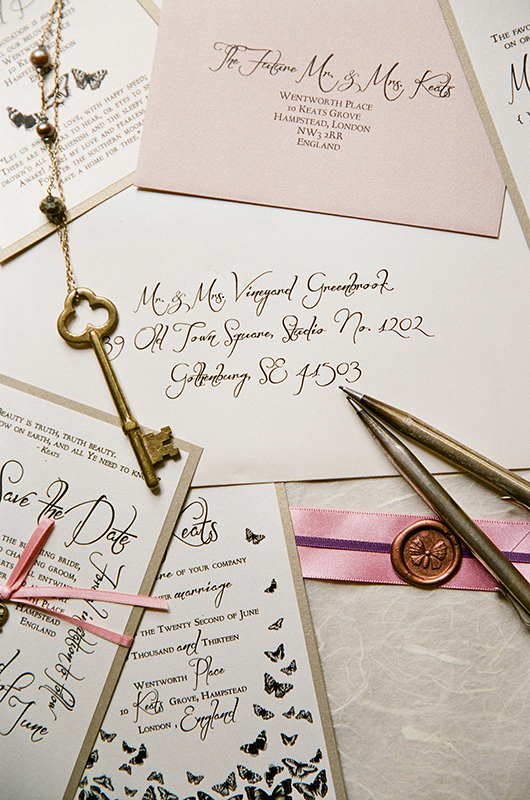 I would like to pay special thanks & tribute to Vintage Invites for their talent & incredible contribution to this shoot.